A adventure camping safari 5 day tour commences in Alice Springs or Ayers Rock and finishes Alice Springs. Our ‘K angaroo Dreaming’ Safari is the ultimate 5 Day 4WD Central Australia adventure safari. We’ll tour Uluru, Kata Tju t a, Watarrka and the West MacDonnell Ranges but more importantly, we’ll get to truly experience the outback in an authentic way - camping at re mote private bush camps, driving on bush tracks and visiting Oak Valley Aboriginal Community. Oak Valley is an inspirational community boasting an olive plantation, Aboriginal rock carvings and paintings as well as an ancient fossil field. • *Multi Tour discount or Family and Friends Four or more discounts not available in conjunction with each other. Departing Alice Springs bright and early , we hit the road on our adventure of a lifetime (For those commencing the tour at Uluru, we will collect you from the Outback Pioneer Hotel or the airport). Our journey begins heading south through the Waterhouse and James Ranges with a stop at the Camel Farm for a Camel ride if you're keen (own expense). We visit Mount Ebenezer Roadhouse where you can view or purchase Aboriginal arti facts. Stop to view Atila (Mount Connor), a mesa tableland and the first significant rock formation of our trip. After a stop for lunch and our arrival at the Uluru - Kata Tju t a National Park, we travel to the base of Uluru where your guide will lead you on an interpretive walk, hearing of the Aboriginal law and r eligion (Tjukurpa). 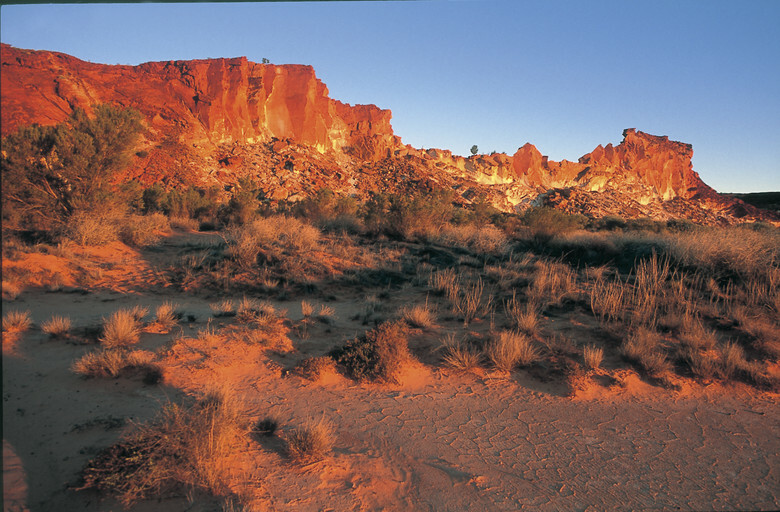 Continuing on, we meet our local Aboriginal Guide who will provide a once in a lifetime authentic Indigenous cultural experience with an interpretive walk to Mutitjulu Waterhole where you will hear the stories of the unique landscapes, art and culture of the local custodians, the Anangu people. This experience is followed by a hands - on dot painting session where you will take your artwork as a memento of your experience. We conclude at the Cultural Centre, where you may explore the dis plays and learn of the flora and fauna of this unique area. Experience the famous changing colours of Uluru at sunset, away from the crowds, complete with sparkling wine and nibbles. It's a great time to kick back and contemplate the day and the vastness of the desert. Afterwards settle in at our remote private camp, complete with our signature Endless Star dining experience before retiring to your swag under the amazing night sky or your comfortable safari tent complete with beds. After watching the sunrise over Uluru and Kata Tju t a from a lookout close to our campsite, it's breakfast and then off to Kata Tju t a for a 7km hike through the magnificent "Valley of the Winds". After a leisurely lunch we travel to Kings Creek Station for our second night’s remote outbac k campsite . Our private campsite at Kings Creek is miles from the crowds, which is where the feeling of ‘w ayoutback ’ really starts to take hold. After a campfire dinner it's time to kick back and be mesmerised by the millions of stars on display. This morning take a guided walk to see the towering walls, crevices and plateaus of Watarrka (Kings Canyon). Visit the Amphitheatre, Lost City and the tranquil ‘Ga rden of Eden’ . After Watarrka we 4WD along the famous Mereenie Loop Road where you will be shaken and not stirred! Look out for wildlife along the way before arriving at our permanent camp at Glen Helen, nearby the stunning waterhole that the Traditional owners of this land believe is home to an ancient and powerful Rainbow Serpent. 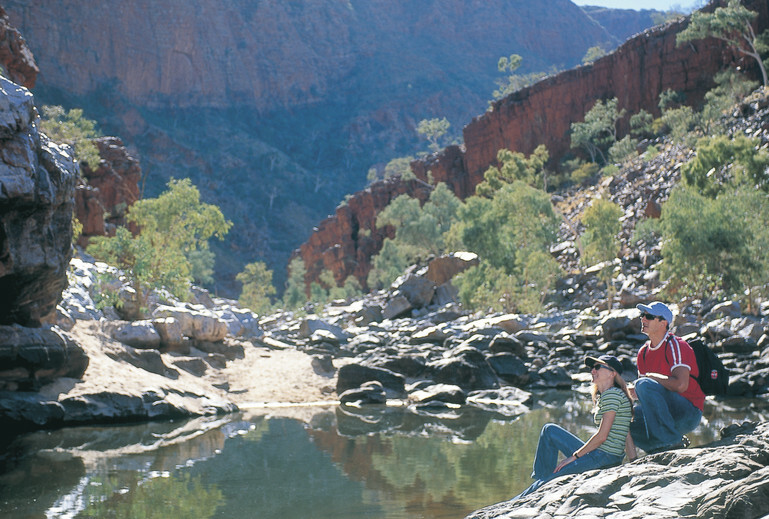 Spend today exploring the mighty West MacDonnell Ranges. Travel ling to Ormiston Gorge, keep your eyes peeled for Perentie Lizards lazing along the banks and take a swim in the rock holes. Hike the “Ghost Gum Walk”, a 1.5 hour loop that takes in views down through the majestic Ormiston Gorge, before following the trail as it descends down close to the gorge and along the rocky floor and Ormiston Waterhole. We journey on to the Ochre Pits, a registered sacred site offering a unique experience to view the Ochre deposit still used to this day by the Traditional owners. S ee the natural ochres that have provided materials for Indigenous people for thousands of years. Afterwards, we travel on to Ellery Creek Big Hole, one of the most picturesque swimming and walking spots in the West MacDonnell Ranges. Surrounded by high r ed cliffs and the sandy Ellery Creek, the waterhole has been carved out by thousands of years of massive floods and is an internationally significant geological site. The permanent water here made it a special meeting place for the Arrernte people and is k nown to them as Udepata. Late in the afternoon we will 4WD in to our remote bush camp. Tonight it is just us and the wilds, providing a great opportunity to star gaze away from the city lights from the comfort of your swag. After a hearty breakfast we cross the famous Owen Springs Reserve , our destination the inspirational * Oak Valley Aboriginal Community. Spend time with the Traditional owners e xploring the land, try your hand at Boomerang throwing, see ancient rock art paintings and carvings and gain a personal experience of the profound understanding the owners have of this pristine remote environment. Travelling back to Alice Springs via the O ld South Road, stop in at the E w an inga Art site before returning to your accommodation approximately 5.30pm. • Booked and paid E-Ticket, Torch, wide brimmed hat, sunscreen, insect repellent, water bottle (1.5 litres), walking shoes/boots, sleeping bag (if you prefer to use your own), toiletries, swim wear, towel, camera, comfortable and casual clothing for 5 days. • Professional guide, travel in an air-conditioned 4WD vehicle, Aboriginal Guided walk and Dot Painting workshop at Uluruall meals (as listed on itineraries), camping equipment, including permanent tent with beds and mattress. All linen including pillow and pillowcase, fitted sheet, sleeping bag hire, towel and drinking water (please provide your own bottle). 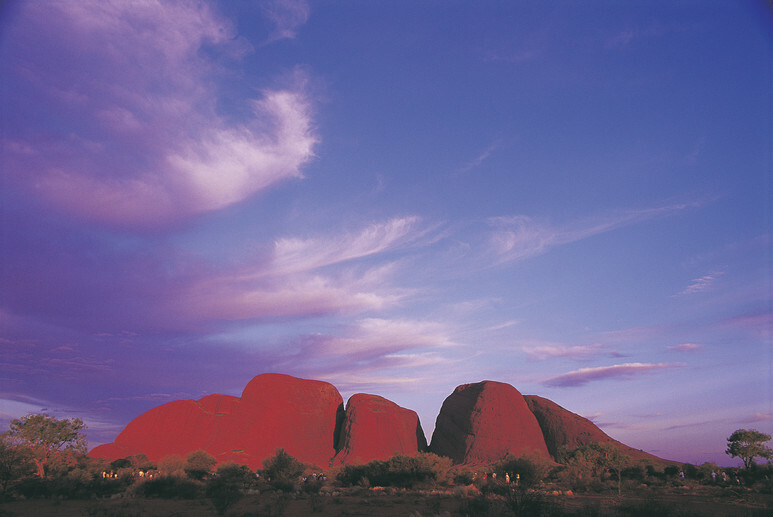 • " We recommend guests arrive on the Jetstar or Virgin Australia flights into Ayers Rock. Although we collect guests arriving on the later Qantas service please note guests will not receive a full experience at Uluru should they choose this service. • For those joining us at Ayers Rock lunch is not included on day one. Guest should have lunch prior to commencement of Safari. • " We recommend guests arrive on the Jetstar or Virgin Australia flights into Ayers Rock. Although we collect guests arriving on the later Qantas service, guests will not receive a full experience at Uluru should they choose this service. • Due to limited space on the vehicle please restrict luggage to a day pack and one soft overnight bag/backpack (maximum 10kg). Excess luggage should be stored at your Alice Springs accommodation. If commencing at Ayers Rock please ensure you have an overnight bag/backpack with the items you require for the 5 days packed inside as your large luggage will be stored in the vehicle and not accessible during the safari. • Whilst we always aim to get you to the airport on time, delays which are out of our hands may occur. These may include, but not limited to; Traffic delays, road closures, vehicle breakdowns and accidents. Wayoutback will not be liable or responsible for any missed fights and always recommend travel insurance. Fitness Level: 2 out of 5: Two and three day trips that include easy walking.. Minimal physical exertion required.